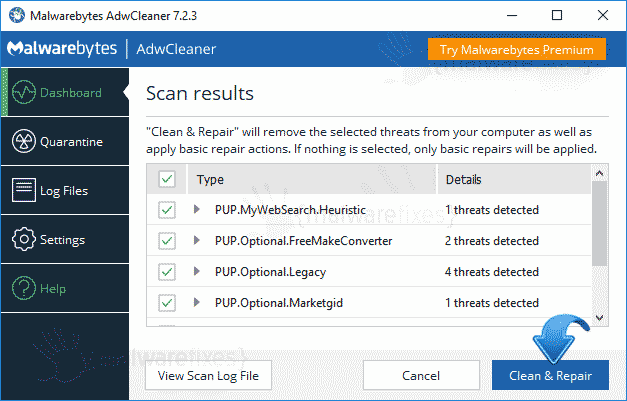 AdwCleaner is a computer security tool that was designed to find and delete adware, unwanted toolbar, browser hijacker, and potentially unwanted programs. This tool is a stand-alone program that finds and removes recent infections of adware and other unwanted applications. AdwCleaner also detects if a browser hijacker is controlling the web browser by checking current settings. AdwCleaner specifically targets adware that were installed on the computer without user’s approval. We are talking of adware that is commonly bundled with freeware such as Internet speed booster, download manager, multimedia players, and free games. Upon installing such program, users are unaware that adware will also be installed without seeking for their permission. Unless you do custom installation of the downloaded program, you will no option of rejecting the adware. Normally, affected browser will see signs of adware presence right away. Toolbar is added to the menu that contains redundant buttons and links. Home page is also affected. Instead of the usual default setup, affected browser will utilized a custom search engine as assigned by the adware. With the help of free AdwCleaner from Malwarebytes Team, you can easily remove many variants of mentioned computer disorder. Scanning the computer and deleting harmful entries will make your Internet browsing more safe and efficient. 1. Obtain the most recent copy of AdwCleaner from its official web site. 2. After downloading, browse for file location and double-click on adwcleaner.exe. 3. AdwCleaner instantly start the program. To begin scanning the computer, click on Scan button. 4. After the scan, this tool will log the result on a .TXT file. You can view the contents by opening the file via Notepad later. 5. To start removing identified adware, click on Clean & Repair button. 6. Please restart the computer after the cleanup process. I have tried to follow the steps as close as possibly for removal of this nationzoom malware. I have never seen anything like this diabolical thing and I’m not sure I got it all. It seems to just be re-producing itself. I remove it and it and it makes 2 more in its place. We will see what happens at the end. I’m thrilled as well as grateful, that people have given their time and extraordinary talents to help us make this right. I just think when I’m finished that I will have screwed it up. I wills post what everything looks like then. I have to say you must be impressing someone. I had malware that originated from freeware that I didn’t supervise properly while installing. There were about three or four forms and I had trouble identifying all sources. When I located a website that correctly identified the main problem and offered suggestions about how to resolve it, one of the suggestions was to use AdwCleaner. When I tried to go to the link, the popups went mad trying to block me and redirect me to their clients. Good news is that AdwCleaner solved all sources of malware instantly. Thanks so much. I get rid of that crap! This really worked, and fast! This thing worked like a brand new blender. Perfectly. It even threw out all the old messed up pineapples and moldy blueberries on my computer, and all I was left with was a beautiful browsing smoothie. Mmm. Delicious. I recommend this to ANYONE plagued with those “shoppers’ experience” pieces of trash. 3 thumbs up. Hey guys, you really helped me; that was just wonderful, especially the TornTV was real stubborn, but you helped me do things fast. I am not a rich guy yet, but tell me how can I help you? Maybe, by telling my friends about your site? Keep up the good work folks. Appreciate it. I have no idea how to sign up for it. So far, unbelievable! I could never imagine it would work so fast. You guys really deserve to get all the best, thanks a lot! Can someone please help? When I run the adwcleaner program it seems to work but then when I hit Clean, it freezes up and won’t respond. Any ideas what to do? Thanks! Thank you so much….. I get too sad with any unusual happening on my laptop..some bloody Bing.vs thing, hugs and kisses. Adwcleaner downloaded. Will not work. Will not close. Cannot uninstall. Please assist. I rarely leave comments, but this is the only thing that worked and it worked so well that I felt obligated to come back and praise it. Throw out the skepticism and hit download already, that virus is only going to get worse! This works like magic. Quick and efficient. Though I did have to reset my Chrome settings since one malware program apparently got missed in the cleanup. Thank you for this post! I am so happy that this removed navsmart.info in my browser after trying other malware removal program. Only adwcleaner clean and remove permanently this stubborn browser. So smooth really appreciate you search algorithms. I have locked malware in my trash and can’t delete them. They are Javeview.update.plist and Manrolling.update.plist. How do i remove them. I have tried everything including Malwarebytes..I also have Kernel_task eating lots of memory on my mac. I need help!! Thank you. Thanks so much!! I especially appreciated that you posted malware fixes step by step, given that I have limited knowledge of computer programs & therefore tend to be suspicious & get stressed out about accidentally downloading something malicious. This was a company called Techcube trying to sell you tools and antivirus when they show you that you have a virus on your computer. Sells for as high as 499.99 but disguising themselves as a microsoft tech. When you dont buy he leaves all that adware on your computer and hangs up. Someone needs to report them to Microsoft. Not okay to put bloatware on your computer to try to sell you something, also not okay to pretend like they are microsoft tech guys. Tried to tell me Avast and MalwareBytes were not good programs to have because they are free. But guess what, those 2 along with revouninstaller got rid of all of their stuff on my computer. Thanks to all you guys! It worked for my pc. Thanks. Thank you so much! It helped me! I was annoyed by the virus called Noad Variance TV. Great tool thank you Author! Anyone have this happen and have a solution? Thanks in advance, this is an annoying malware. I thought I was smart.. I was wrong XD thank you!! Same problem as Kate in 2015…it downloads and scans but will not delete the files…it freezes up…Kate did you find a solution? Thank you very much. This removed Counterflix which made my laptop unusable. what if the computer infected with cherimoya cannot open any websites in any browser anymore, cannot run malwarebytes or install malwarebytes even when i attempt to install from a flash drive? it seems i have a bit of a roadblock here. in an old mbam log that detected cherimoya, i discovered a rootkit, i think it may be the same? when it was infected malwarebytes scanned and discovered over 300 + threats and i chose delete on reboot but when re-scanned after it was thee same thing….. Anyone had any success removing ak.staticimg.com cookie? It resists AdwCleaner as it did with CCleaner and Malwarebytes.